Redseer Consulting, one of the reputed research and advisory firms has declared Flipkart as the #1 Indian ecommerce portal. As per their latest RedSeer E-tailing Leadership Index (ELI), Flipkart has scored 91 points, which helped them narrowly beat Amazon which scored 87 points in various categories. 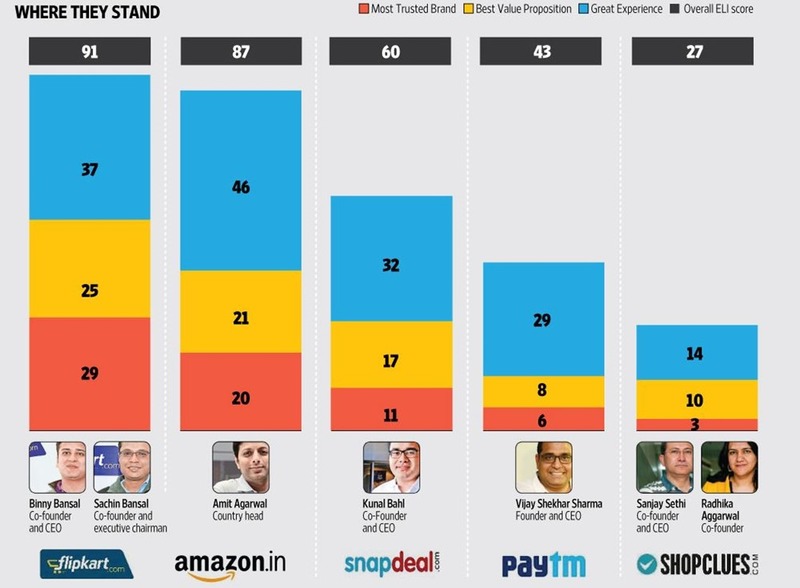 Snapdeal is #3 most preferred ecommerce portal, but their score is merely 60, which proves that the Indian ecommerce battle is right now between Flipkart and Amazon only. Paytm, whose focus is right now on launching their payment bank and expanding their mobile wallet has fared poorly at #4 with just 43 points. Shopclues is at #5 with 27 points. When it comes to the gap of 4 points between Amazon and Flipkart, then there is a very interesting finding: the only differentiator between these two ecommerce portals is price, and due to Flipkart’s lowest price offers, they were able to beat Amazon, which is several times larger than them in terms of market value and age. Amazon offers 55 million products from 85,000 sellers, and has 21 warehouses of their own, besides providing logistics and technology to 50 other warehouses of their sellers across India. In comparison, Flipkart offers 40 million products via 90,000 sellers and own just 17 warehouses across India. Redseer surveyed these top 5 ecommerce firms across various categories like trust factor, overall buying experience, product availability, delivery, price competitiveness and refund process. Responses from 3000 online shoppers across 30 cities were taken to derive the results. Interestingly, researchers tracked prices of more than 600 mobile phones and tracked the delivery of around 6000 orders. As per Redseer, mobile phone was chosen because they constitute majority of online orders. The period for this research was January-March, 2016. The analysis and research by Redseer found that Amazon has scored more in several categories such as user experience across various age categories and products; besides navigation and overall website and app experience. However, when it comes pricing, then Flipkart is the numero-uno leader, atleast for mobile phones. This single factor enabled them to beat Amazon in the overall ranking. Besides this, Flipkart also scored maximum for ‘brand trust’ across different age groups and recorded fastest refund time and reverse pickup for mobile phones. The one area where Flipkart lacked was overall delivery speed, which is surprising because Flipkart’s logistics division eKart is now dedicatedly foraying into this niche, and they are even delivering orders of other ecommerce portals like Paytm. While Amazon has been asked to improve their refund process, Snapdeal and Shopclues, both have scored well above Flipkart in delivery speeds. Snapdeal, on the other hand, has scored poorly on customer service pointers; and Paytm has scored very less points on trust factor as a brand. Inclination towards Chinese products is one of reasons for low trust of Paytm products? Do share your opinion on this ranking of ecommerce portals by commenting right here. "Flipkart Declared As Champion Of Low Price; Beats Amazon In Ecommerce Leadership Survey", 2 out of 5 based on 8 ratings. There are no reviews and rating both for products and sellers. Will never buy from paytm.